We’ve been working very hard. 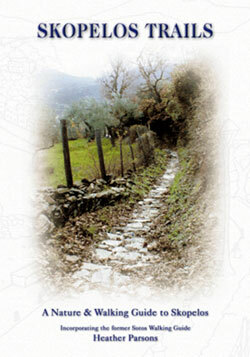 Now reopened is the portion of trail from Epermacho church, Potami up towards Ag Ianni Skleri. Whilst we were there, we not only cleared the trail of fallen trees but also widened the trail like never before. The upper Abuzali trail up to Raches is now open. 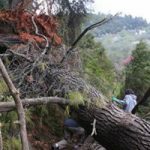 We’ve made a start on Epamacho church trail (Potami) up towards Ag Iannis Skleri but what I thought would be a quick snip has turned into a huge operation as so many trees are blocking the way. We’re about halfway through. Work will resume on Saturday as we feel the need for a day off to rest our weary bones! 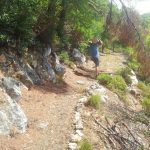 I’ve been working on a new website, dedicated to The Retsina Trail. If you’d like to take a look, you’ll find it at: http://theretsinatrail.wordpress.com I hope you not only enjoy the site but also get to actually walk the trail. 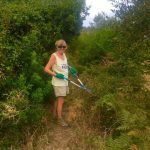 It’s been an excellent year for the trails with absolutely super volunteers from all over the world coming to help. I thank them all. Having a chain saw has made a huge difference too, so thank you to everyone who donated to the crowd funder. I’d also like to thank Peter Booth, Catriona Forth, Cynthia and Tom and Anita and Paul, for donating a day of their holiday to help. The Geocaches also went well with tourists using the trails in order to find the caches that I’d hidden beside various paths. There will be more! We will now be taking a break. See you next year! 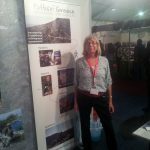 I recently had the pleasure of accompanying Mary Diamantis, the president of the Skopelos Hoteliers Union, to Naupaktos where an Eco Tourism exhibition took place. It was heartening to see how many islands were being supported by their local councils in the area of trail clearing and in general, eco tourism. 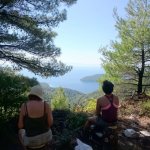 I made several contacts and hope to be able to improve the situation here on Skopelos even more in the future. In the meantime, Cindy, the last volunteer, decided to quit. So the trail clearing has come to a grinding halt as it’s not worth getting a replacement. Such a shame for all the prospective volunteers I turned down in her favour. She worked 2 days. We’ve just said ‘Good-bye'(9 October) to Emily from the US and Jack from the UK who have been working here since 18 September. They were excellent volunteers and worked very hard indeed without complaint! 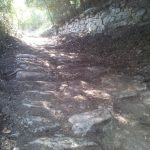 We did a bit of maintenance on the Retsina Trail but concentrated mainly on the new Monks Trail, Glysteri. We’ve widened the first portion up to the Tsukalus spring and actually reopened the trail from the spring upwards, where we found a buried calderimi. Having done that, with a view to joining it up to the trail leading to the rubbish tip, Jack found ANOTHER calderimi leading AWAY from that direction. It’s very wide and in excellent condition. However, on their last working day, we reached a collapsed avraya (supporting wall) with rocks so large it would take more than a couple of people to lift back into position. But where does it lead? The next volunteer, Cindy Sheahan from Canada, arrives 11 October. We welcomed our first Greek volunteer recently, Dimitris Zachos. It was good to have a strapping lad around, capable of lifting heavy logs. 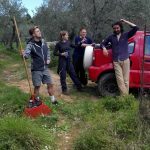 We gave the Retsina Trail a clean up and put up a sign at the Platanakia end. We now have Elisabet Juul Nordebo helping. She is our first Swedish volunteer. We are working at Glysteri towards Tzukala spring. 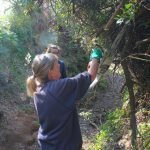 There are a lot of thorny shrubs to clear which is like picking up barbed wire. Very slow going. But the calderimi is in excellent condition. I’ve been overwhelmed by volunteer applications for this period. If only I had the resources to accommodate and feed everyone who wants to help; we’d get the trails cleared in no time at all. The clearing will start on Monday 5 September. I have our first Swedish volunteer, Elisabet, arriving 3 September, followed by Jack and Emily on the 15th then Cindy and Theresa from Canada on 11th October. Photos of our progress will be posted as and when. If you will be visiting during September or October and would like to donate a day or two, please don’t hesitate to contact me. Gloves and tools provided!! I think we can safely say that the trail clearing season has well and truly closed. No more volunteers until 1 September. 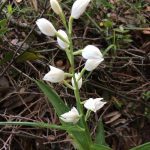 It was a very successful spring and all the volunteers were marvelous. Thanks to them progress is being made. 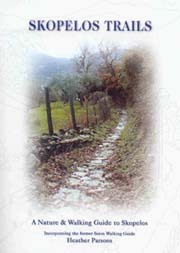 Throughout July/August I will be away walking the Camino de Sandiago. The mail order service for the map and guide book will be suspended during this period so if you think you may want a copy by mail order, please order before 13 July as it will be your last chance until 1 September. Somebody is erecting an illegal fence on The Resina Trail. The portion is on Anania Hill. They are blocking the top, near Ag Nikalaus and the bottom near Ag Paraskavi. It’s very make-shift and easy to dismantle so don’t be put off. It has been reported.